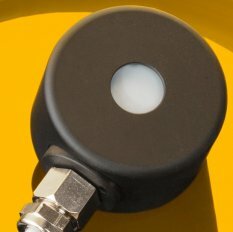 Standard surface-mount 180o FOV digital UV sensor. The sglux digital sensors convert the photocurrent generated by a Silicon Carbide (SiC) UV photodiode into numeric information. The digital sensors use the CAN bus protocol which is known from automotive applications. The benefit of a digital sensor compared with an analogue sensor is a large dynamic range of 5 orders of magnitude (3 orders of magnitude if an analogue sensor is used). Another benefit is an almost unlimited cable length and perfect protection against electromagnetic influences.